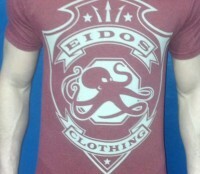 Our first Eidos Signature Tee design has been released! 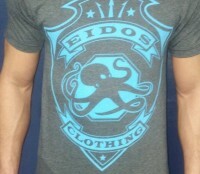 These tees are incredibly soft and comfortable with a great fit. Wear them out or to the gym, either way, you’ll feel and look great. Choose this stylish Red Brick Black Heather shirt if you’re looking to add a little color to your wardrobe. These shirts are NOT preshrunk. They may look a little big at first, but will shrink down to normal size. 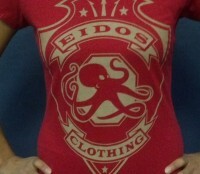 We didn’t forget the women’s shirt! This stylish design looks just as good on women as it does men! These shirts run on the small size. We suggest ordering one size up. 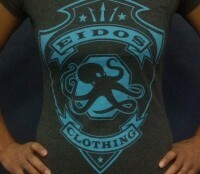 Stand out in the crowd with this stylish and comfortable Heather Grey tee with neon blue print. 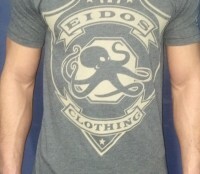 You can’t go wrong with this classic Heather Gray tee with tan print.